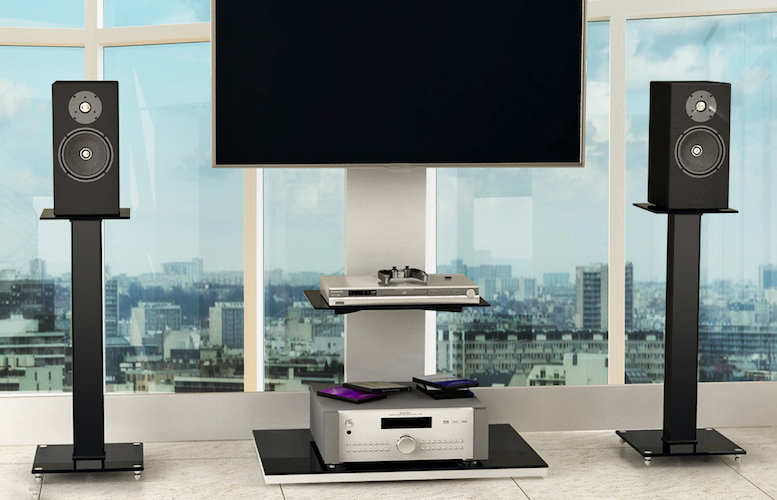 The new category includes eight different models of floor stands, wall or ceiling mounts and a bookshelf mount for speakers. These new products are sold as a pair and are now shipping. The 23.6-inch tall Glass and Wood Bookshelf Speaker Stands (AS-SPKR-5) feature sound decoupling feet to reduce vibration on hard floors. Floor spikes are available for carpet to add stability and reduce sound vibration. The are built from solid aluminum with an MDF wood insert stand and black glass top. The 23.6-inch tall Glass Bookshelf Speaker Stands (AS-SPKR-8) feature sound decoupling pads to reduce vibration on hard floors, a solid aluminum supporting pillar, and black glass top. The Adjustable Metal Satellite Speaker Floor Stands (AS-SPKR-11) are built from solid steel and provide wiring management. The Anti-Theft Speaker Mount (AS-SPKR-18), which is constructed from steel and aluminum, offers adjustable swivel and tilt features for optimal sound positioning, mounts on the wall or ceiling, with a tilt range of 90 degrees and a rotation of 360 degrees. The Nylon-construction Satellite Speaker Mounts (AS-SPKR-19) offer adjustable swivel and tilt feature for optimal sound positioning, mount on the wall or ceiling, with a tilt range of -90 to +90 degrees. Also made from Nylon, the Small Multi-Directional Satellite Speaker Mounts (AS-SPKR-20), Medium Satellite Speaker Mounts (AS-SPKR-24), and Large Bookshelf Speaker Mounts (AS-SPKR-26) provide adjustable pivot and tilt features for optimal sound positioning from a wall mount, supporting 7.7 lbs, 22 lbs, and 33 lbs, respectively.